Although there was a new man at the helm in the form of Frank Klopas, many Montreal Impact players familiar from last year were back on the pitch Wednesday, as the Impact edged Fluminense FC U23 1-0 in their opening match of the Walt Disney Pro Classic. Sanna Nyassi notched the only goal of the game, as he used his left foot to bang in a rebound of a diving stop made by the Brazillian netminder in the 18th minute. 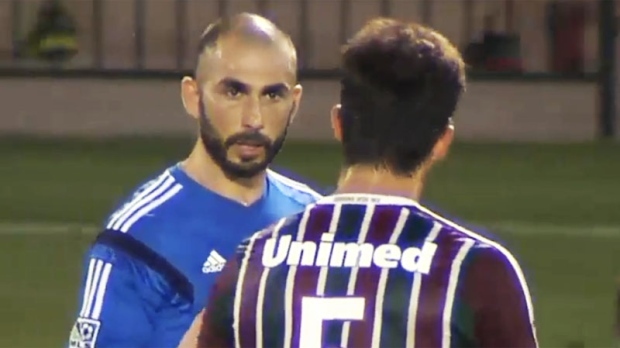 The veteran Impact squad went full-out against the younger Brazililans, as Marco Di Vaio, who led the team in scoring last season, was given a yellow card in the 76th minute for a conflict with an opponent. Troy Perkins got the clean sheet for the victorious Impact, while Hassoun Camara also stood out for some fine play. Wandrille Lefèvre, Matteo Ferrari, Eric Miller; Hernan Bernardello, Justin Mapp, Felipe Martins, Collen Warner and Andrew Wenger also saw action. The Impact won the same tournament with a victory over Columbus in Orlando last year.